Aden. 1937-1952. A selection of MH/U GVI stamps. ADEN / SOUTH ARABIA. South Arabia Overprint. 10c Examples. With Full Margins. Full sheet placed under plastic sheet for photograph, possible light reflection on images. Full 10 x 10 Sheet. Sheet is in good condition, with no apparent perf separation. 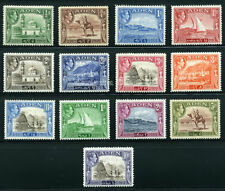 ADEN 1939-48 KGVI Definitive Set of 13 SG16-27 in fine unmounted mint condition CV £120. 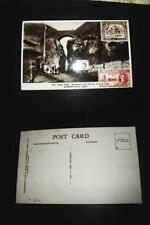 Aden 1951 George VI Complete set SG 36-46 Mnh. 1951 George VI Complete set. Unmounted mint. A COUPLE OF LOWER VALUES WITH MINOR TONING. AS PER SCAN. TRISTAN DA CUNHA 1952 GVI SET OF 12 IN MNH MARGINALS (SEE SCANS). 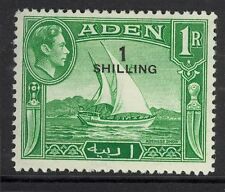 Aden, British Colony, 1937, Stanley Gibbons # 11 mint MH, cleanly / lightly hinged, very light stain spots at bottom. In demand colony. Key value. Aden, Colonie Britannique, 1937, Stanley Gibbons # 11 neuf , charnière propre / légère, très légères rousseurs en bas. Aden, Qu’aiti, British Protectorate, 1963, Stanley Gibbons # 41 / 52 complete mint MNH, almost all with sheet margins. In demand colony. XF / Perfect. Colonie demandée. TTB / Luxe. = MNH = neuf sans charnière / mint never hinged. Aden, Qu’aiti, British Protectorate, 1942, Stanley Gibbons # 1 / 11 complete mint MNH, several with sheet margins / corner. In demand colony. Aden, Qu’aiti, Protectorat Britannique, 1942, Stanley Gibbons # 1 / 11 complet neufs sans charnières, certains avec bords / coin de feuilles. Elizabeth II. Definitive set including listed shades and perf changes, except 15c Deep Greenish Grey (53a). Unmounted Mint. 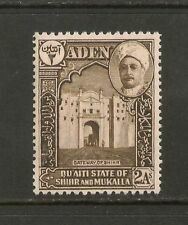 Aden, British Colony, 1937, Stanley Gibbons # 12 mint MH, certificate, cleanly hinged, light stain spots at bottom. In demand colony. Key value. Aden, Colonie Britannique, 1937, Stanley Gibbons # 12 neuf , certificat, charnière propre, légères rousseurs en bas. You are also responsible for viewing the picture before you buy. ADEN SG46 1951 10s on 10r SEPIA & VIOLET. A FINE MOUNTED MINT STAMP. South Arabia, British Protectorate, 1966, Stanley Gibbons # 68 / 76 complete mint MNH, variety black overprint instead of red. In demand colony. Scarce set. Colonie demandée. Série rare. = MNH = neuf sans charnière / mint never hinged. SG.19/22. Lightly Mounted Mint. (SALE WEEK.3). ADEN - STATES Quaiti - Hadhramaut 1966 Churchill 15c unmounted mint showing Winston Churchill OVERPRINT INVERTED variety SG 66a. Very fine. Condition as per scan, no hidden faults. Sputh Arabia / Aden Hadhramaut. SG53-64 set 1966. Aden SG 46 Lightly Mounted Mint definitive. Catalogue value £42 in 2016. Aden - Qu'aiti 1951 KGVI set complete very fine used. SG 20-27. Sc 20-27. Aden-Qu'aiti 1951 KGVI set complete very fine used. Gibbons # 20-27. Scott # 20-27. Aden 1937 1r brown SG9 MNH - creamy coloured gum. MNH - Mint Never Hinged. MLH/MM (etc) - a mix of MLH and MM with the majority being MLH. Used - used and in a good collectable condition. FU - Fine Used. I will respond quickly. The scan / picture / image - represents the actual item and is a part of item grading. MNH - Mint Never Hinged. I have multiple sets for sale, the scan may not be of the actual set that you buy but it will be of equivalent quality. Used - used and in a good collectable condition. FU - Fine Used. 1953 definitives; all values up to 1/-. SG 48/63 (16 blocks of 4).